The Red Queen’s Hypothesis is valid, a team of researchers from the University of Liverpool have shown this week. The study, which is published in Nature, looked at the changing forms of bacteria-infecting viruses to study the effect that direct competition has on evolution. The hypothesis, put forward in 1973 by the evolutionary biologist Leigh Van Valen, says that all species, to survive, have to continuously evolve new ways of defending themselves in order to keep up their relative fitness with their competition – a good example of this would be the relationship between a predator and its prey: if the prey gains the ability to hide better, the hunter must improve its tracking ability to match. 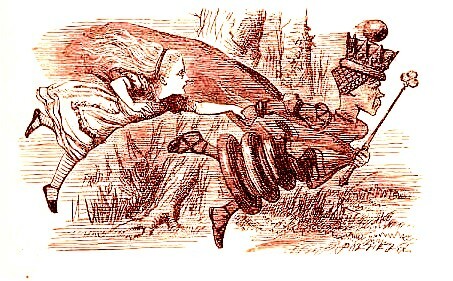 Alice and The Red Queen, running. “Historically, it was assumed that most evolution was driven by a need to adapt to the environment or habitat. The Red Queen Hypothesis challenged this by pointing out that actually most natural selection will arise from co-evolutionary interactions with other species, not from interactions with the environment,” says Liverpool’s Dr Steve Paterson. The researchers observed the evolution of hundreds of generations of viruses, using high-throughput DNA sequencing, which were then allowed to infect bacteria. By using fast evolving viruses, the team was able to see evolution as it took place. In the cases where the bacteria could develop protection, the viruses were seen to evolve faster to compensate, resulting in a greater level of viral diversity – where the bacteria was unable to react, evolution rates were decreased by about 50 per cent. The team hope to move on to investigating how co-evolution progresses in species who assist, rather than compete with, each other. There is ongoing scientific debate about whether viruses constitute “living things”, so whilst the experiment does show dynamic equilibrium of a system in response to its surroundings, this in and of itself is not enough to justify the Red Queen hypothesis.